It turns out that 360-degree video is better with 360-degree lens glass. Researchers at the University of California at San Diego recently created a prototype camera that captures the high-resolution immersive video of heavy rigs while remaining smaller than the average DSLR. The solution? Spherical lens glass instead of the traditional concave lenses — and tiny fiber optic cables. With five 25 megapixel full frame sensors, the PMast is capable of capturing high-resolution stills and video, yet it’s about the size of a DSLR. Compact 360 cameras are available in sizes smaller than a softball, but they don’t offer the same resolution as the pricey multi-camera rigs, often wrapping 4,000 pixels or so around a complete 360 view — sort of like splitting a 4K TV into four separate 1,000 pixel screens and still labeling it 4K. 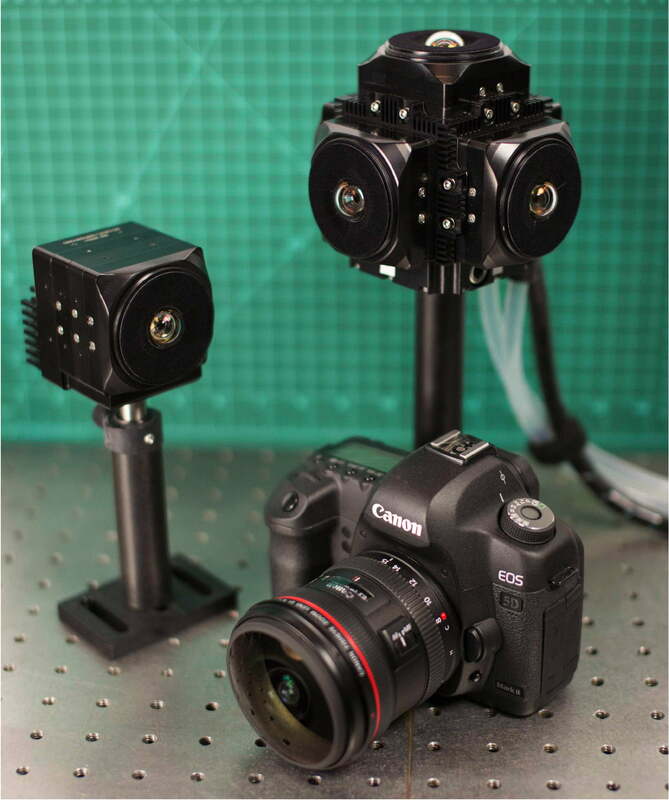 Designed for the Defense Advanced Research Projects Agency (DARPA) with the Photonic Systems Integration Laboratory at UCSD and Distant Focus Corporation, the camera is designed to capture a much higher level of detail without that bulk. While most lenses have a convex shape, PMast’s smaller profile is largely due to a spherical lens that’s smaller than a dime. Spherical lenses have been attempted before, but while they work well at focusing the light, they can’t project that focused image onto a flat camera sensor. Instead, the researchers literally bridged the gap between that spherical lens and the flat sensor with fiber optics. A bundle of tiny glass threads transmits that light from the curve of the glass to the flat sensor, with the focus still intact. PMast is currently only a prototype with five cameras connected at a base. The compact size is hindered by requiring five connected external computers to process and stitch those images — and it wasn’t designed for commercial use in the first place. But, while you won’t likely ever shoot with a PMast, the odd design of the spherical lens is something researchers are hoping could eventually find its way into consumer cameras or even make its way to Hollywood. Nokia 9 PureView vs. iPhone XR: Can HMD Global take on Apple?